A radio system glitch on one of five small rockets aimed at the edge of space has forced NASA to cancel a barrage of overnight launches tonight that promised to dazzle East Coast skywatchers with glowing midnight clouds. The malfunction was detected as scientists prepared for the late-night launch rocket launches, which were scheduled to blast off within about five minutes of one another at NASA's Wallops Flight Facility on Wallops Island, Va. The initial launch was targeted for 12 a.m. EDT (0400 GMT) on Thursday (March 15). 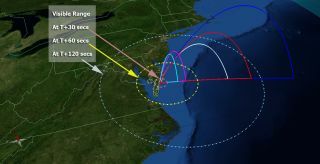 "We scrubbed for tonight and our next attempt will be no earlier than Friday night, March 16," NASA spokesman Keith Koehler told SPACE.com from the Wallops launch site on the Atlantic coast. An internal radio frequency interference problem with one of the payloads on the rockets caused the launch delay, Koehler said. Mission scientists will meet Thursday to discuss the problem as well as study weather reports for Friday's potential launch attempt, he added. The five rockets form the core of NASA's Anomalous Transport Rocket Experiment (ATREX), a $4 million program to study the high-altitude jet stream of wind that blows at speeds of 300 mph (483 kph) at heights of between 60 and 65 miles (97 to 105 kilometers) above Earth. Theories have suggested that these high-altitude winds should only reach speeds of up to 50 mph (80 kph). The edge of space is commonly set at 62 miles (100 km) above Earth. To study the jet stream mystery, NASA scientists have loaded each ATREX rocket with a chemical tracer known as trimethyl aluminum. The experiment is designed to spray the material into the jet stream so observers on Earth can map the winds. That chemical tracer is expected to be seen as glowing, milky white clouds visible to skywatchers along major stretches of the U.S. East Coast, running from southern Vermont and New Hampshire to the border of North and South Carolina. Koehler said that NASA's next window to launch the ATREX rockets stretches from March 16 to April 3. If the radio interference issue is solved, but the weather does not cooperate on Friday, the agency will reconvene for a potential weekend liftoff or plan for another launch try next week, he added. "Next week is supposed to be really nice," Koehler said.